Objective: Given that aripiprazole acts as a partial agonist on the dopamine receptor, it may have unique effects on brain neuro-metabolism, specifically in the prefrontal cortex. In this exploratory study, we investigated the effect of aripiprazole compared to risperidone on prefrontal metabolite levels (Glx, NAA, Creatine, Choline and myo-Inositol) and changes in gray and white matter volume (GMV and WMV) in patients with a psychotic disorder. We hypothesized that patients treated with aripiprazole would show increased levels of Glx and NAA and preserved brain volumes, in contrast to risperidone. Methods: In this randomized, single blind study, patients (n=24) treated with either risperidone or aripiprazole underwent magnetic resonance spectroscopy (1H-MRS) and high-resolution anatomical scans (3T) at baseline and after 9 weeks. LC Model was used to determine the absolute spectral metabolite levels and SPM12 was to perform voxel based morphometry analyses. Both metabolite levels and brain volumes were compared between treatment groups. Results: We found a trend for a different effect of both antipsychotics on Glx levels, whereby risperidone reduced Glx levels compared to aripiprazole. Moreover, patients treated with aripiprazole showed a decreased GMV in the precentral gyrus, caudate and lateral frontal regions and increased WMV in the precentral gyrus and a non-significant but consistent pattern of prefrontal WM increases, in contrast to risperidone. Conclusion: Our results point to possibility of different effects of aripiprazole on brain volume and metabolism compared to risperidone. Studies in larger samples are needed to shed more light on the robustness and nature of such differences. Proton Magnetic Resonance Spectroscopy (1H-MRS) is a non-invasive MR technique that can offer insights in altered metabolite levels caused by various neuropathologies. N-acetylaspartate, (NAA), glutamate, choline (Cho), and creatine (Cre) are the most commonly studied metabolites . N-Acetyl Aspartate (NAA) is the second most abundant metabolite in the human brain involved in synthesis of proteins and neurotransmitter metabolism. Its abundance may reflect neuronal health and neuronal metabolism. Glutamate is an important excitatory neurotransmitter. Using conventional MRS sequences, it is difficult to reliably separate the glutamate and glutamine signals and thus the combined signal Glx is often measured. Choline can be mainly found in glial cells and its level usually indicates membrane turnover or myelin breakdown. Creatine is considered to reflect the brain energy state and to be relatively stable over time and across individuals. Another interesting compound is myo-Inositol (mI), which is involved in osmoregulation, membrane signal transmission and membrane protein binding in mainly glial cells. In schizophrenia, altered levels of glutamate and NAA in the prefrontal cortex have been repeatedly reported [2-8]. Changes in frontal and temporal white matter are one of the most consistent finding in schizophrenia [3,8]. Most studies did not find a significant change in Cr, Cho or mI concentrations in the prefrontal cortex of schizophrenia patients, although some studies did [5,7]. The reported effects may be dependent on treatment states of the subjects . Studies on the effect of antipsychotics have shown both increases and decreases of prefrontal metabolite levels that may be dependent on type, dose or duration of treatment [3,5,9], but reduced Glx and NAA levels have been related to stronger dopamine D2 receptor antagonists [5,6,8]. Lower levels of glutamate and NAA may be indicative of loss of gray and especially white matter tissue that may occur due to the neurotoxicity [4,7,8].Treatment with antipsychotics may also lead to changes in gray and white matter volume (GMV and WMV), and there may also be an interaction between neurometabolite levels and brain volume . Though studies have shown both increases and decreases in brain volume, most previous studies have shown reduced volumes after treatment with antipsychotics [11-13], and strong dopamine antagonists appear to lead to stronger volume decreases than weak dopamine antagonists . These effects may be specific to certain brain areas, and volumes of certain brain areas may indeed even increase after treatment . The heterogeneity in effects of different antipsychotics can be assumed to be dependent on their receptor profile. Unlike other antipsychotics, aripiprazole doesn’t block the dopamine D2 receptor, but instead acts as a partial agonist. It is also a postsynaptic 5-HT2A antagonist and 5-HT1A agonist. Whereas postsynaptic dopamine-2 receptor blockade of most antipsychotics may induce or even exacerbate a hypo-dopaminergic state in the prefrontal , aripiprazole with its unique receptor profile has shown to counterbalance the hypo- and hyperdopaminergic conditions . In this exploratory study we investigated the effect of a 9-week treatment with aripiprazole compared to risperidone on prefrontal metabolite levels, including Glx, NAA, Creatine, Choline and myo-Inositol. This study focused on changes in white matter, as this may be more affected . We also investigated structural changes in gray and white matter volume. Given its effects on the prefrontal cortex, we hypothesized that patients treated with aripiprazole would show increased levels of Glx and NAA after treatment, whereas patients treated with risperidone would show decreased levels. We also hypothesized that risperidone would be associated with decreased volumes of gray and white matter in contrast to aripiprazole. These effects may be most pronounced in striatal and prefrontal regions. This trial, in which aripiprazole was compared to risperidone regarding brain function, was preregistered (EUDRA-CT: 2007-002748-79) and executed in accordance with the declaration of Helsinki after approval by the local ethical committee of the University Medical Center Groningen (METC 2007.139). Task effects on brain activation are described in Liemburg, et al. (in prep). Baseline results of MRS findings have been reported previously ; the current report concerns the treatment effects, involving pre- and post 1HMRS measurements and highresolution T1-weighted scans. Power analysis before starting the current trial was based on the study of Honey, et al. , who reported a study on activation of the frontal cortex and compared risperidone with a typical antipsychotic . Given the effect size of t = 2.6 (α = 0.01) with an N of 10 in each group and a p-value of 0.007, we included N = 12 in each group to have a power of > 0.80. Participating subjects provided oral and written consent after the procedure had been fully explained. Patients in this trial (n = 24) were recruited from mental health care centers in the northern part of the Netherlands and randomly assigned to treatment with either aripiprazole or risperidone. Randomization was performed by sealed envelopes created by the first author that were opened by an independent researcher not involved in the study and unknown with the study content. Patients could be medication naïve at baseline or use an oral antipsychotic other than the treatment drugs. Dosage of study medication could flexibly be adjusted by the clinician, but was preferably 7.5-15 mg for aripiprazole and 2-5 mg for risperidone. Clinicians were given a maximum of three weeks for switching to or starting the study medication, followed by six weeks of monotherapy with the target antipsychotic. Measurements took place at baseline and after nine weeks of treatment. If patients wished to stop their treatment but were willing to complete the study, the second measurement was conducted earlier but at minimum after six weeks. Diagnosis was based on the Schedules for Clinical Assessment (SCAN 2.1) diagnostic interview . All patients meeting DSM-IV criteria for a diagnosis of schizophrenia or a related non-affective psychotic disorder were included. A comorbid depression was allowed. Patients had to abstain from drugs and alcohol 24 hours before testing. Further exclusion criteria included age < 18 or > 60 years, recent substance abuse (< 6 months), MRI incompatible objects (e.g. medical pumps, prostheses, piercings, red tattoos), (suspected) pregnancy, claustrophobia, history of neurological abnormalities (e.g. epilepsy), history of severe head injury, brain infarction, and inability to provide informed consent. Severity of symptoms was assessed with the Positive and Negative Syndrome Scale (PANSS) . Depression was measured with the Montgomery Asberg Depression Rating Scale (MADRS) . Experienced (side) effects of the antipsychotics were measured by using the Subjective Response to Antipsychotics (SRA)  and the Subjective Wellbeing under Neuroleptics (SWN) . Demographical data (e.g. age, gender, handedness) were also recorded. Since part of the subjects was young and had not finished education, the highest education level that a subject finished or expected to finish was recorded according to Verhage (range: 1. elementary school to 8. university) . Type and dose of antipsychotic were also recorded pre-treatment and after treatment, and doses were converted to haloperidol equivalents . To test for baseline differences, age, education and haloperidol equivalents were compared using a Mann Whitney U test because of non-normality, and gender, handedness and type of antipsychotic using a Chi-square test for independence. The Positive, Negative and General pathology scale of the PANSS and MADRS total score were compared between both treatment groups using a repeated measures ANOVA with group as a between-subjects factor and measurement (pre vs. post) as a within-subjects factor. Scans were acquired in the Neuroimaging Center of the University Medical Center Groningen (UMCG) in Groningen using a 3T Philips Intera (Best, the Netherlands) equipped with a synergy SENSE eight-channel head coil. 1H-MRS singlevoxel spectroscopy was used to assess proton metabolites in the white matter of the left lateral prefrontal cortex with an 8 cm3 voxel. The voxel was placed in line with the genu of the corpus callosum on the anterior side and oriented in the same line as the corpus callosum and the falx cerebri, inclusion of white matter was maximized (Supplementary Figure S1). This examination was carried out using Point Resolved Spectroscopy (PRESS) sequence of 5 minutes, with one 90° and two 180° pulses, and water suppression with a selective 140 Hz RF pulse and a subsequent RF inversion pulse. This was the standard protocol when the data acquisition started. Automated firstorder B0 shimming at the ROI was performed prior to MRS. Spectra were recorded within the following parameters: TE = 144 ms, TR = 2000 ms, samples = 1024, bandwidth = 2000 Hz, VOI = 20x20x20 mm, signal averages (NSA) = 128. Moreover, a T1-weighted image (160 slices; isotropic voxels of 1 mm; TR 25 ms; TE 4.6 ms; α 30°; FOV 256 mm) covering the whole brain was acquired. The spectral data of the glutamate + glutamine (referred to as Glx) peak, the NAA + glutamic acid (NAA + NAAG; referred to as NAA), glycerophosphocholine + phosphocholine (GPC+PCh; referred to as Cho), creatine + phosphocreatine (Cr+PCr; referred to as Cre) and myo-Inositol (Ins; referred to as mI) peak were analyzed with LCModel34. Absolute metabolite levels were determined by scaling based on the unsuppressed water peak, indicated as institutional units (i.u.). Data were excluded if metabolite concentrations had an estimated standard deviation higher than 20% of the estimated concentration (Cramer-Rao bounds) or deviated more than 3 standard deviations (SDs) from the group mean. The anatomical scan used was segmented using SPM12 (FIL Wellcome Department of Imaging Neuroscience, London, UK). The segmented scans were used to determine the gray matter (GM) and cerebrospinal fluid (CSF) content of the spectroscopy voxel. Correct localization of the voxel on the segmented scans was confirmed by checking a picture of the voxel placement acquired during scanning. The metabolite concentrations were extrapolated to 100% using the fraction of white matter within the voxel to correct for partial volume effects. The average and standard deviation of the metabolite levels were determined, together with 95% confidence interval (Cramer- Rao bounds) of measurement precision. To select confounding variables, the correlations between metabolites and age, gender, subjective weight changes (SRA), and baseline and post-treatment haloperidol equivalents were also calculated. The effect of treatment with antipsychotics on partial volume corrected metabolite levels was tested using repeated measures ANOVA with group as a between-subjects factor and measurement (pre vs. post) as a within-subjects factor. Because of the limited number of tests and considering the exploratory nature of this study, we did not correct for multiple comparisons . In case of a significant association, covariates significantly correlated to metabolite concentrations were added to the model (haloperidol equivalents at baseline), to check whether these could explain the association. Image origins of the T1-weighted scans were manually set at the anterior commissure and segmented into gray matter, white matter, and cerebrospinal fluid (also used for partial volume correction). The Diffeomorphic Anatomical Registration Through Exponentiated Lie algebra (DARTEL) approach of SPM12 was used to create gray and white matter templates and these were used to warp the segmented images on. Flow fields were generated and Jacobian scaled warped tissue images were created from the flow fields and the warped images. Finally, the data was smoothed using an 8 mm full width half maximum (FWHM) Gaussian kernel and normalized to the Montreal Neurological Institute (MNI) space, because an 8 mm smoothing kernel is optimal for detecting morphometric differences in both large and small neural structures [27,28]. Statistical nonParametric Mapping (SnPM13)  was used to investigate the interaction between measurement (pre vs. post) and group on gray matter volume (GMV) and white matter volume (WMV) and the main effect of treatment across groups. Analyses were performed with variance smoothing of 8 mm FWHM and 5000 iterations. To select confounding variables, the correlations between partial volumes and age, gender, subjective weight changes (SRA), and baseline and post-treatment haloperidol equivalents were also calculated. Whole brain volume (sum of gray and white matter) was added as a covariate to adjust for their effect on regional brain tissue volumes. Results were threshold at p < 0.001, FDR cluster corrected at p < 0.05, k > 20. For clusters showing a significant interaction, mean GM and WM brains per group and condition were calculated and median GMV or WMV within the cluster per group were plotted for interpretation. Analyses were repeated with age and haloperidol equivalents pre-treatment (both significantly correlated with brain volumes) as nuisance variables. We included a group of patients with a mean age of 28 years, of which 88% were males. The mean duration of illness was 3.9 years. In the group of aripiprazole patients 5 (42%) had a first episode psychosis and in the risperidone group 3 (25%), which explains the high incidence of psychosis NOS as a diagnosis, because these patients did not meet the time criteria for a diagnosis of schizophrenia. Of the patients treated with aripiprazole, 6 (50%) were non-medicated at the time of inclusion and the other patients used antipsychotics with a mean dosage of 3.3 mg haloperidol equivalents. In the risperidone 6 (50%) were non-medicated and the others used 3.6 mg haloperidol equivalents on average. Groups did not differ significantly in age, gender, education, handedness, duration of illness, diagnosis, types of antipsychotics and pre- and post-treatment haloperidol equivalents (Table 1). Repeated measures ANOVA showed that there was a significant improvement of Positive symptoms in both groups (p < 0.0005) and of General pathology (p = 0.002), and a borderline significant improvement in MADRS depression (p = 0.048). There was no significant effect of treatment group or an interaction. One subject in the aripiprazole group had to be excluded due to excessive head motion during the MRS acquisition. One subject was scanned after six week and one after eight weeks because of side effects of risperidone and insufficient clinical effect of aripiprazole respectively. Table 1: Demographic and clinical characteristics of both treatment groups. Figure 1 depicts the changes in metabolite concentration corrected for partial volumes over time. The average WM partial volume was 60%. Repeated measures ANOVA showed that there was a significant main effect of treatment for NAA (F (1, 21) = 6.0, p =0.023), a trend for a main effect of treatment (F = 3.5, p =0.077) and a significant interaction with group (F = 4.6, p =0.043) for Glx, and a main effect for Creatine (F = 5.4, p =0.030). After correction for significant covariates, only the interaction between treatment and group for Glx (F (1, 15) = 4.1, p =0.057) showed a trend for significance. Figure 1: Changes in metabolite concentrations after treatment with either aripiprazole (black) or risperidone (gray), concentrations are given in institutional units (i.u.). Figure 2 shows gray and white matter changes due to treatment with aripiprazole and risperidone. After treatment, patients treated with aripiprazole had decreased GMV in the right precentral gyrus, left head of caudate, left inferior frontal gyrus, and right middle and inferior frontal gyrus, while risperidone showed an increase in these brain regions. Supplementary Table 1 shows all blobs at p < F, T > 3, k > 20. Patients treated with aripiprazole showed a trend for an increase in WMV in the precentral and postcentral gyrus, in contrast to the risperidone treated group. Though not cluster-corrected significant, a similar pattern was also observed in different parts of the prefrontal cortex. There was no significant main effect of treatment. Adding covariates did not change the findings. Graphs of two representative changes are added as supplementary Figure S2. Figure 2: Changes in GMV (left) and WMV (right) after treatment with antipsychotics, blue = increase in risperidone, red = increase in aripiprazole (p<0.001). In this exploratory study we investigated the effect of treatment with either aripiprazole or risperidone on lateral frontal metabolite concentrations and on brain volume changes. Importantly, given the small sample size the conclusions are merely speculative but hopefully encourage follow-up studies. We observed a relevant trend of the effect of both antipsychotics on Glx levels, whereby risperidone reduced Glx levels compared to aripiprazole. Moreover, patients treated with aripiprazole showed a decreased GMV in the precentral gyrus, caudate and lateral frontal regions, in contrast to risperidone, which is against our hypothesis. There was also a trend for increased WMV in the pre- and postcentral gyrus and a nonsignificant but consistent pattern of prefrontal WM increases after aripiprazole treatment, while these regions showed decreased volumes after risperidone treatment. Consistent with our observation regarding Glx, some studies have shown decreased prefrontal levels glutamate after treatment with both weak and strong D2 receptor antagonists [30,31]. Other studies did not show a treatment effect on glutamate levels in the prefrontal cortex [32-35], although in one studies improvement of negative symptoms was related to increased Glx levels  and improvement on total PANSS to lower Glx levels . The observed changes by antipsychotics on Glx levels may be caused by their dopaminergic effects on glutamatergic receptor activity and density and modulation of glutamate release . The differential effect of aripiprazole on dopamine transmission may thus increase prefrontal glutamate levels, in contrast to other antipsychotics. For other metabolites, we did not find clear differences in treatment by aripiprazole or risperidone. 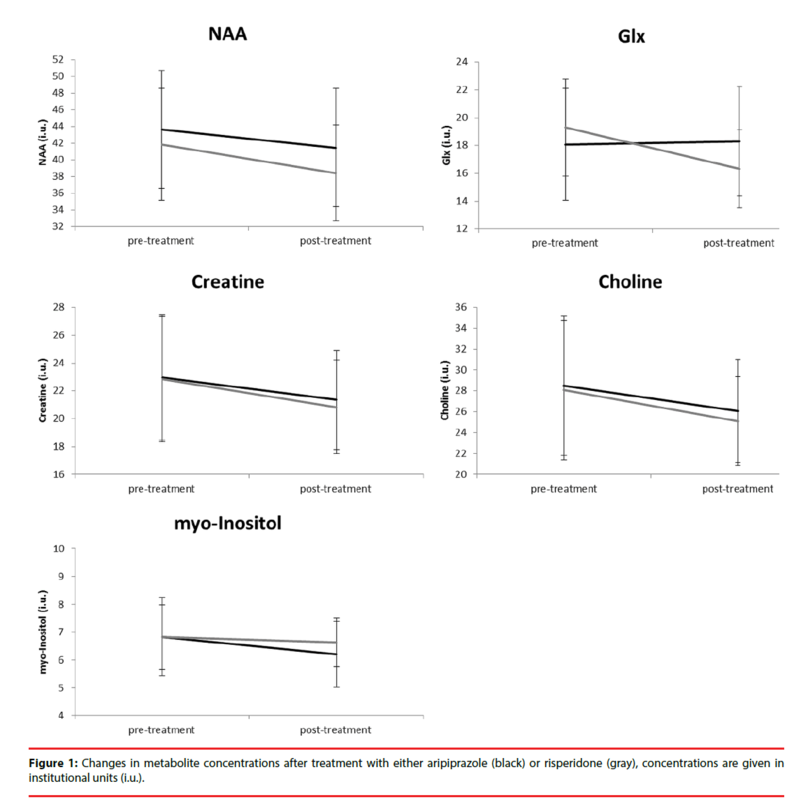 We observed an effect of treatment irrespective of antipsychotic for NAA, Glx and Creatine, but this appears to be caused by higher doses pretreatment with other antipsychotics, as results disappeared after correction for baseline haloperidol equivalents. Other studies have also failed to show an effect of treatment on prefrontal NAA levels with both strong and weak D2 antagonists in recently medicated patients [37-39]. It has been reported that NAA did initially not decrease after treatment , but eventually did after multiple years , although the authors could not confirm whether these effects were specific to antipsychotic exposure. There are also studies that have shown that antipsychotics decrease NAA levels at follow-up , that strong antagonists did but weak D2 antagonists did not , or that NAA levels increased more after atypical than typical treatment [41,42]. These effects may again be caused by differences in sample size or characteristics, follow-up period, or type and dose of antipsychotics. Clearly, larger studies are needed or meta-analyses to draw definite conclusions. Concerning the brain volume effects, aripiprazole decreased GMV in the precentral gyrus, caudate and lateral frontal regions and non-significantly increased WMV in the pre- and postcentral gyrus and prefrontal regions, while risperidone showed an opposite pattern. A cross-sectional study on risperidone and olanzapine in 30 schizophrenia patients showed that in comparison with healthy controls, patients had bilateral decreased GMV in the antero-medial cerebellar hemispheres, rectal gyrus and insula, and bilateral increases in the basal ganglia . Another study has shown decreased frontal and increased temporal GMV . Unfortunately, no study has investigated changes in brain volume after treatment with aripiprazole as yet. While GMV reductions are indeed generally seen in frontal and other cortical regions, increased striatal volume has also been observed by other studies [13,14]. Moreover, it has been suggested that atypical may have a neuroprotective effect . A relatively low dosage of risperidone (mean = 2.3 mg) prescribed in our study may have caused increased GMV volumes. Our reduced WM volumes after risperidone treatment are congruent other studies. Molina et al. found significantly smaller WMV in the internal and external capsules and parahippocampal gyrus  and Girgis, et al. in frontal regions and corpus callosum . Another study showed decreases in white matter tract perfusion after treatment with both aripiprazole and risperidone . Up until now, no comparable studies have been published in which aripiprazole and risperidone are contrasted in terms of effects on GMV. We can therefore only speculate about potential mechanisms underlying the pattern of GMV reductions and WMV increases of aripiprazole that oppose the effects of risperidone. One study has shown that chronic treatment with antipsychotics and mood stabilizers has opposite effects on cortical brain volumes and the authors suggest that pleiotropic effects of mood stabilizers may play a role . Similar effects may occur with aripiprazole. Szeszko et al. suggest that metabolic side-effects of antipsychotics may cause WMV decreases . As aripiprazole has few metabolic side effects, this may explain the differential effect with risperidone on WMV. Finally, in young adults gray matter declines whilst white matter increases, while in older adults these measures both decline with age. Because we mainly included young first episode patients, the patterns we observed in aripiprazole may be natural patterns occurring, though the follow-up period is possibly too small to detect such effects. Importantly, previous studies have observed a relationship between prior degree of structural alterations and treatment-induced changes [14,47]. In this relatively young group this knowledge would have provided valuable information. This is the first longitudinal randomized single-blind controlled trial investigating the neuro-metabolic and volumetric brain effects of aripiprazole compared to a full D2 receptor antagonists. Some limitations should be mentioned however. A major point is the small sample size. Medication trials are very challenging to conduct, due to the clinical demands of such trial (e.g., being able to participate in the various assessments and lack of preference of study medication given the randomized assignment). Meta-analyses of several small trials could provide a solution for this problem. Moreover, the follow-up time was relatively short and this may have caused a lack of power as well. Effects of previous medication may also have an influence on the current findings, although two thirds of the subjects were medication free or only used antipsychotics for a few weeks. Furthermore, correction for baseline haloperidol equivalents was performed. Concerning data-acquisition, a 1H-MRS protocol was used that may not have been optimal to detect subtle changes in metabolite levels. However, spectral quality was acceptable to good for all patients included in the analyses. In conclusion, aripiprazole appears to have different effects on brain metabolism and volume compared to risperidone. Prefrontal glutamate levels may be preserved in contrast to what is seen with full dopamine antagonists. Moreover, aripiprazole appears to have different effects on gray and white matter volume of the brain. Given the small sample size, drawing firm conclusions is not possible though. Meta-analyses may help to increase power of challenging pharmaco-MRI studies. We thank all subjects for participating in the study. This work was supported in part by an ERC grant (StG2012-312787) and in part by an European Science Foundation EURYI grant (NWO no. 044035001), both awarded to AA. HK is on the speakers list of and/or has received unconditional grants from Janssen, Eli Lilly, Bristol Meyers Squibb, Astra Zeneca and Eli Lilly. AA has received speakers fees from Lundbeck. All disclosures have no relation to the work described. EJL and ASK declare they have no conflicts of interest. Currie S, Hadjivassiliou M, Craven IJ, et al. Magnetic resonance spectroscopy of the brain. Postgrad. Med. J 89(1), 94-106 (2013). Marsman A, van den Heuvel MP, Klomp DW, et al. Glutamate in schizophrenia: a focused review and meta-analysis of (1)H-MRS studies. Schizophr. Bull 39(1), 120-129 (2013). Poels EM, Kegeles LS, Kantrowitz JT, et al. Glutamatergic abnormalities in schizophrenia: a review of proton MRS findings. Schizophr. Res 152(2-3), 325-332 (2014). Abbott C, Bustillo J. What have we learned from proton magnetic resonance spectroscopy about schizophrenia? A critical update. Curr. Opin. Psychiatry 19(2), 135-139 (2006). Schwerk A, Alves FD, Pouwels PJ, et al. Metabolic alterations associated with schizophrenia: a critical evaluation of proton magnetic resonance spectroscopy studies. J. Neurochem 128(1), 1-87 (2014). Steen RG, Hamer RM, Lieberman JA. Measurement of brain metabolites by 1H magnetic resonance spectroscopy in patients with schizophrenia: A systematic review and meta-analysis. Neuropsychopharmacology 30(11), 1949-1962 (2005). Kraguljac NV, Reid M, White D, et al. Neurometabolites in schizophrenia and bipolar disorder - a systematic review and meta-analysis. Psychiatry. Res 203(2-3), 111-125 (2012). Brugger S, Davis JM, Leucht S, et al. Proton magnetic resonance spectroscopy and illness stage in schizophrenia--a systematic review and meta-analysis. Biol. Psychiatry 69(5), 495-503 (2011). Szulc A, Galinska-Skok B, Waszkiewicz N, et al. Proton magnetic resonance spectroscopy changes after antipsychotic treatment. Curr. Med. Chem 20(3), 414-427 (2013). Plitman E, Nakajima S, de la Fuente-Sandoval C, et al. Glutamate-mediated excitotoxicity in schizophrenia: A review. Eur. Neuropsychopharmacol 24(10), 1591-1605 (2014). Fusar-Poli P, Smieskova R, Kempton MJ, et al. Progressive brain changes in schizophrenia related to antipsychotic treatment? A meta-analysis of longitudinal MRI studies. Neurosci. Biobehav. Rev 37(8), 1680-1691 (2013). Vita A, De Peri L, Deste G, et al. The Effect of Antipsychotic Treatment on Cortical Gray Matter Changes in Schizophrenia: Does the Class Matter? A Meta-analysis and Meta-regression of Longitudinal Magnetic Resonance Imaging Studies. Biol. Psychiatry 78(6), 403-412 (2015). Leung M, Cheung C, Yu K, et al. Gray matter in first-episode schizophrenia before and after antipsychotic drug treatment. Anatomical likelihood estimation meta-analyses with sample size weighting. Schizophr. Bull 37(1), 199-211 (2011). Torres US, Portela-Oliveira E, Borgwardt S, et al. Structural brain changes associated with antipsychotic treatment in schizophrenia as revealed by voxel-based morphometric MRI: an activation likelihood estimation meta-analysis. BMC. Psychiatry 13(1), 342 (2013). Dauvermann MR, Whalley HC, Schmidt A, et al. Computational neuropsychiatry - schizophrenia as a cognitive brain network disorder. Front. Psychiatry 5(1), 30 (2014). Bortolozzi A, Diaz-Mataix L, Toth M, et al. In vivo actions of aripiprazole on serotonergic and dopaminergic systems in rodent brain. Psychopharmacology (Berl) 191(3), 745-758 (2007). Liemburg E, Sibeijn-Kuiper A, Bais L, et al. Prefrontal NAA and Glx Levels in Different Stages of Psychotic Disorders: a 3T (1)H-MRS Study. Sci. Rep 6(1), 21873 (2016). Honey GD, Bullmore ET, Soni W, et al. Differences in frontal cortical activation by a working memory task after substitution of risperidone for typical antipsychotic drugs in patients with schizophrenia. Proc. Nat. Acad. Sci (USA) 9(23), 13432-13437 (1999). Giel R, Nienhuis F. Scan 2.1: Schedules for Clinical Assessment in Neuropsychiatry (In Dutch). Geneve/Groningen: WHO (1996). Kay S, Fitzbein A, Opler L. The positive and negative syndrome scale (PANSS) for schizophrenia. Schizophr. Bull 13(2), 231-267 (1987). Williams JB, Kobak KA. Development and reliability of a structured interview guide for the Montgomery Asberg Depression Rating Scale (SIGMA). Br. J. Psychiatry 192(1), 52-58 (2008). Wolters HA, Knegtering R, Wiersma D, et al. Evaluation of the subjects' response to antipsychotics questionnaire. Int. Clin. Psychopharmacol 21(1), 63-69 (2006). Naber D, Moritz S, Lambert M, et al. Improvement of schizophrenic patients' subjective well-being under atypical antipsychotic drugs. Schizophr. Res 50(1-2), 79-88 (2001). Verhage F. Intelligentie en leeftijd: Onderzoek bij Nederlanders van twaalf tot zevenenzeventig jaar. Assen: Van Gorcum (1984). Andreasen NC, Pressler M, Nopoulos P, et al. Antipsychotic dose equivalents and dose-years: a standardized method for comparing exposure to different drugs. Biol. Psychiatry 67(3), 255-262 (2010). Bender R, Lange S. Adjusting for multiple testing--when and how? J. Clin. Epidemiol 54(4), 343-349 (2001). White T, O'Leary D, Magnotta V, et al. Anatomic and functional variability: the effects of filter size in group fMRI data analysis. Neuroimage 13(4), 577-588 (2001). Honea R, Crow TJ, Passingham D, et al. Regional deficits in brain volume in schizophrenia: a meta-analysis of voxel-based morphometry studies. Am. J. Psychiatry 162(12), 2233-2245 (2005). Goto N, Yoshimura R, Kakeda S, et al. Six-month treatment with atypical antipsychotic drugs decreased frontal-lobe levels of glutamate plus glutamine in early-stage first-episode schizophrenia. Neuropsychiatr. Dis. Treat 8(1), 119-122 (2012). Choe BY, Suh TS, Shinn KS, et al. Observation of metabolic changes in chronic schizophrenia after neuroleptic treatment by in vivo hydrogen magnetic resonance spectroscopy. Invest. Radiol 31(6), 345-352 (1996). Goff DC, Hennen J, Lyoo IK, et al. Modulation of brain and serum glutamatergic concentrations following a switch from conventional neuroleptics to olanzapine. Biol. Psychiatry 51(6), 493-497 (2002). Aoyama N, Theberge J, Drost DJ, et al. Grey matter and social functioning correlates of glutamatergic metabolite loss in schizophrenia. Br. J. Psychiatry 198(6), 448-456 (2011). Theberge J, Williamson KE, Aoyama N, et al. Longitudinal grey-matter and glutamatergic losses in first-episode schizophrenia. Br. J. Psychiatry 191(1), 325-334 (2007). Szulc A, Galinska B, Tarasow E, et al. Proton magnetic resonance spectroscopy study of brain metabolite changes after antipsychotic treatment. Pharmacopsychiatry 44(4), 148-157 (2011). Laruelle M, Kegeles LS, Abi-Dargham A. Glutamate, dopamine, and schizophrenia: from pathophysiology to treatment. Ann. New York Acad. Science 1003(1), 138-158 (2003). Bustillo JR, Rowland LM, Jung R, et al. Proton magnetic resonance spectroscopy during initial treatment with antipsychotic medication in schizophrenia. Neuropsychopharmacology 33(10), 2456-2466 (2008). Szulc A, Galinska B, Tarasow E, et al. The effect of risperidone on metabolite measures in the frontal lobe, temporal lobe, and thalamus in schizophrenic patients. A proton magnetic resonance spectroscopy (1H MRS). Pharmacopsychiatry 38(1), 214-219 (2005). Pae CU, Choe BY, Joo RH, et al. Neuronal dysfunction of the frontal lobe in schizophrenia. Neuropsychobiology 50(3), 211-215 (2004). Bustillo JR, Lauriello J, Rowland LM, et al. Effects of chronic haloperidol and clozapine treatments on frontal and caudate neurochemistry in schizophrenia. Psychiatry. Res 107(3), 135-149 (2001). Bertolino A, Callicot JH, Mattay VS, et al. The effect of treatment with antipsychotic drugs on brain N-acetylaspartate measures in patients with schizophrenia. Biol. Psychiatry 49(1), 39-46 (2001). Ertugrul A, Volkan-Salanci B, Basar K, et al. The effect of clozapine on regional cerebral blood flow and brain metabolite ratios in schizophrenia: relationship with treatment response. Psychiatry. Res 174(2), 121-129 (2009). Molina V, Reig S, Sanz J, et al. Increase in gray matter and decrease in white matter volumes in the cortex during treatment with atypical neuroleptics in schizophrenia. Schizophr. Res 80(1), 61-71 (2005). Girgis RR, Diwadkar VA, Nutche JJ, et al. Risperidone in first-episode psychosis: a longitudinal, exploratory voxel-based morphometric study. Schizophr. Res 82(1), 89-94 (2006). Szeszko PR, Robinson DG, Ikuta T, et al. White matter changes associated with antipsychotic treatment in first-episode psychosis. Neuropsychopharmacology 39(6), 1324-1331 (2014). Vernon AC, Natesan S, Crum WR, et al. Contrasting effects of haloperidol and lithium on rodent brain structure: a magnetic resonance imaging study with postmortem confirmation. Biol. Psychiatry 71(10), 855-863 (2012). Yue Y, Kong L, Wang J, et al. Regional Abnormality of Grey Matter in Schizophrenia: Effect from the Illness or Treatment? PLoS. One 11(1), e0147204 (2016).